I used to not like salmon. I am not sure why. Maybe because I grew up eating ocean fresh fishes of South Korea and never got used to these type of fatty fish from the North Atlantic ocean. Anyhow, to make the long story short…, I enjoy my salmons now. 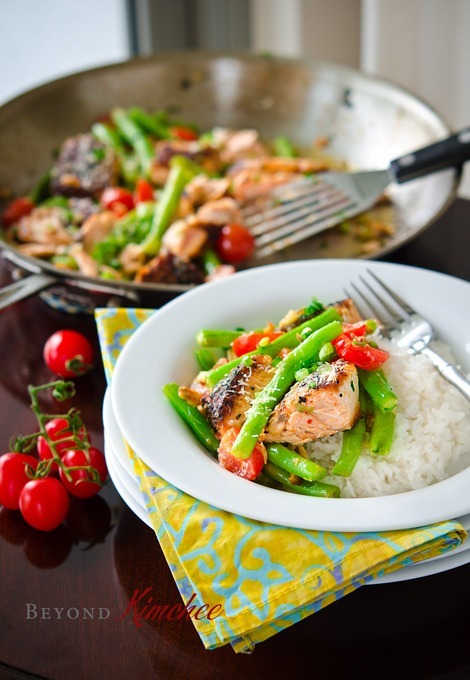 Salmons are quite versatile fish to come up with different ways to enjoy. 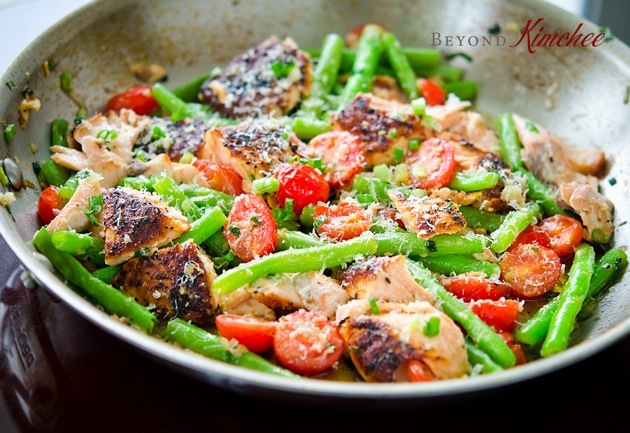 Here is one dish that I feed my family often, Salmon with green beans and tomatoes. Very simple with only a few ingredients that everyone might have, you can put this dish on your dinner table in a very short time. The taste…? Delicious, of course! Even people who doesn’t like fishes raved. And yes, it is HEALTHY! 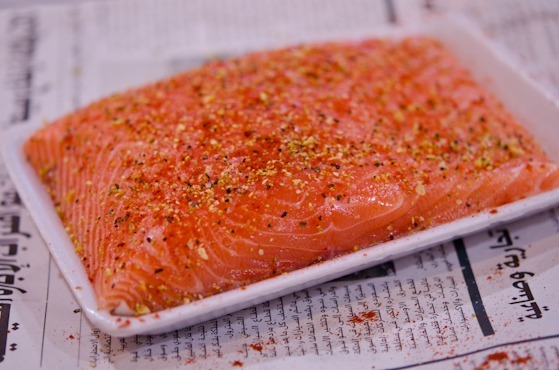 Sprinkle generous amount of salt and lemon pepper to your beautiful fillet of salmon. Heat oil on your skillet and sear your fillet skin side down first, about 5 minutes. FLIP and sear on the flesh side, another 5 minutes. You will see the fish will leak lots of oil. 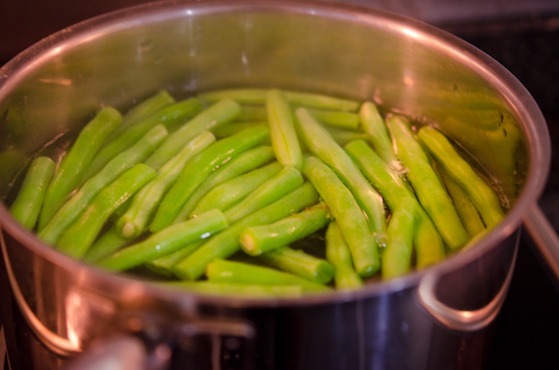 Meanwhile trim your green beans and blanch in the boiling water until soft yet firm. Mine was perfect at 3 minutes. 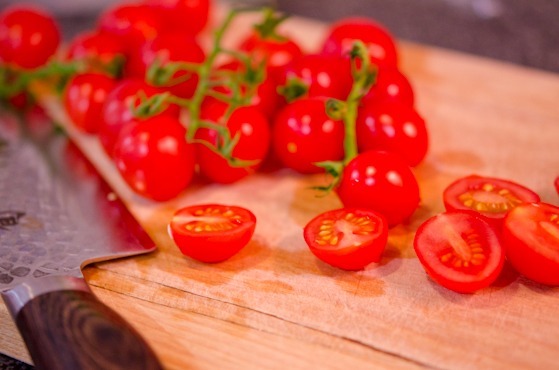 Cut your beautiful cherry tomatoes in half. 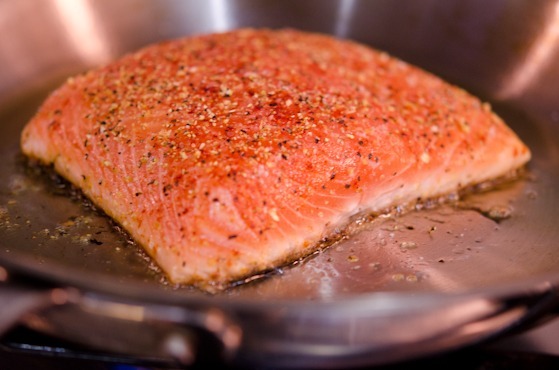 Break your salmon into big bite size chunks using a fork. I discard the skin. A quick rinse to the skillet which I used to sear the salmon. Melt butter over medium heat and fry some chopped green onion and garlic (which I forgot to take a picture). Add green beans and season with salt. Continue to cook over medium heat. Add salmon and tomatoes. Heat through. I like to add a few dashes of hot sauce to this dish. It just adds a nice zing. You can use Tabasco as well. Sprinkle some Parmesan cheese, toss, and you are good to go. I serve with rice but any pasta would be great as well. It’s time for me to say my summer goodbye. I am taking my annual summer break from blogging again. I am excited to re-bond with the nature of wild-wild-west of U.S spending time with my in-laws. I can’t blog while I’m gone but I will be opened to messages, so feel free to drop a note. Till we meet again, have a spectacular summer and stay cool! 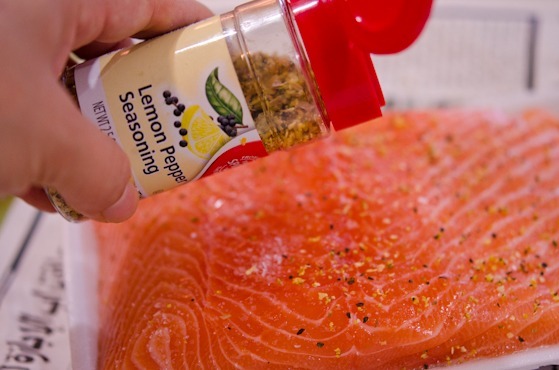 Sprinkle generous amount of salt, lemon pepper, and paprika over salmon fillet on both sides. 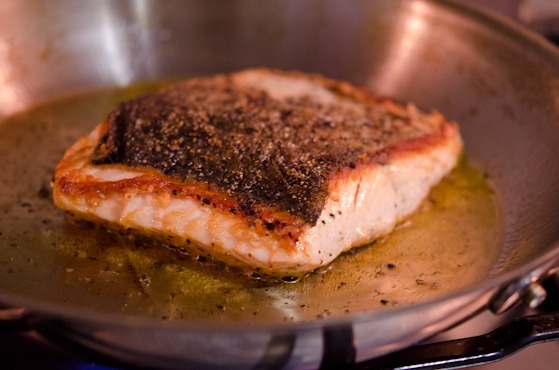 Heat olive oil in a skillet over medium heat and sear the fillet for 5 minutes on each side or until the salmon is almost cook through and creates crisp crusts. Do not overcook your salmon. Remove the salmon filet and set aside. 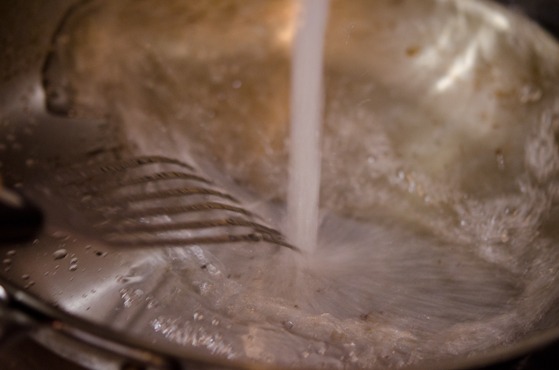 Rinse your skillet and wipe dry. 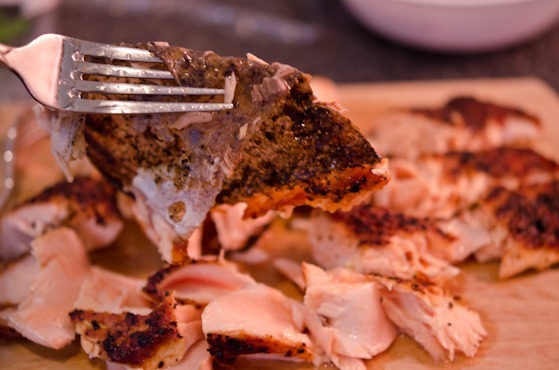 Break your salmon fillet to big bite size chunks using forks. Set aside. Bring the skillet over medium heat and melt butter. 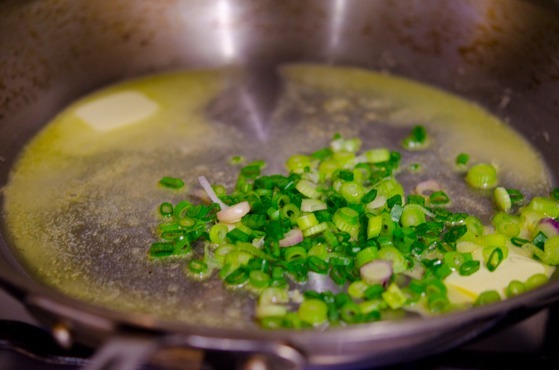 Add the green onion and garlic, saute for 1 minute. 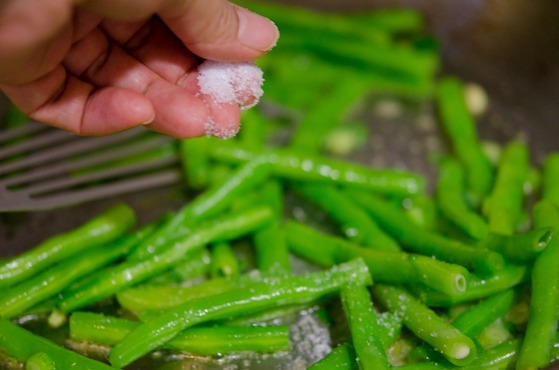 Add the green beans and season with salt, cook for 1-2 minutes. 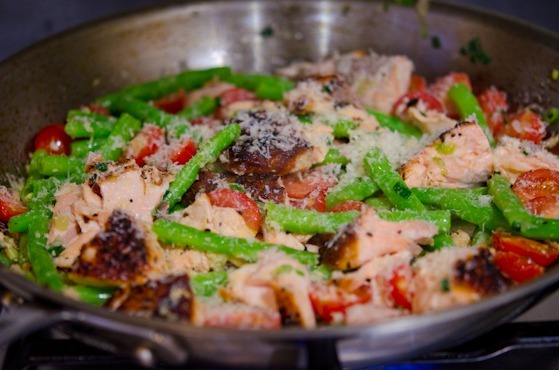 Return the salmon chunks and tomatoes to the mixture and heat through. Add the Parmesan cheese and stir. 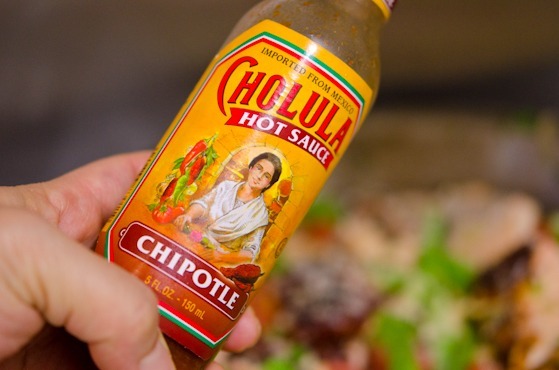 Add a few dashes of hot sauce if you wish. Serve warm over rice or pasta. I think salmon is that type of fish where many either like it or not. It's not my husband's favorite, but he eats it because I make it often since my daught was little and would ask for salmon with steamed broccoli and rice....who could say no? I now can fix it different ways and this looks like it will make the top of my list to try. I like the chipotle sauce to it. Perfect! Have a great summer! Thanks Lyndsey. You are right on salmon. Either you love it or hate it. I didn't like it at the beginning but I began to enjoy as I keep trying to cook different ways. Yum! This looks really good - will have to make it. My husband and I both love salmon, so no problem there. Even the grand-kids who were here last, when I fixed salmon, loved it. :) This is not only a delicious and healthy dish, it's also a beautiful dish to serve - with all the vibrant colors. Have a great summer! Thank you Sandy. You have a great summer, too. I really don't like salmon unless it's wild, so I'm glad you also used to dislike this fish that everyone seems to love (actually it's the only fish I don't like and many people I know say it's the only fish they like, funny isn't it?). Farmed salmon is too greasy and too violent in taste for me, but I love the wild one. Unfortunately I can rarely buy it... Your dish looks fabulous and I love the explosion of so many colours in the first photo! I can imagine how great it would be with wild salmon! Thanks Kat! It is great light dinner for summer time. Mmm I love salmon! I'm always looking for new ways to cook salmon. Love this recipe. I can't wait to try it! I love this recipe! It's easy, it's tasty, it's healthy. Plus it's really pretty! Super job. Have a great time on your vacation - we'll all miss you, but will be here when you return. 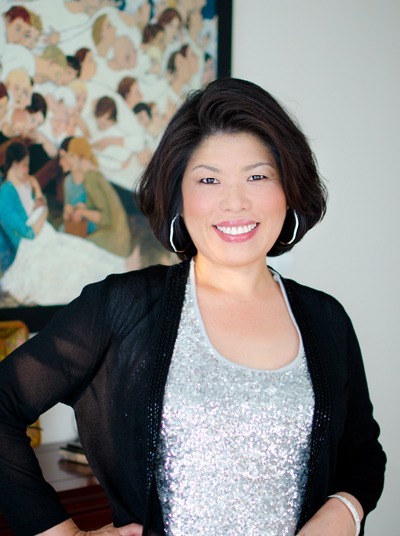 I just found your blog,and my oh my it is simpy divine! 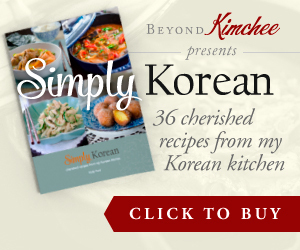 :D This recipe looks really quick,easy and tasty.Thank you! What an unusual combination of flavors -- I love eating salmon in the summer as it combines so well with the season's vegetables. Enjoy your holiday and I look forward to more posts soon! Yummi. This looks absolutely delicious. And it sound really simple. The perfect after work food. Your dish had me drooling... and crying a little for that salmon skin! :) Don't like it at all, huh? Great blog! You just gain a new reader. Hi Jack! Yes, you can add the whole tomatoes to cook to release their juices. It will be even more flavorful. 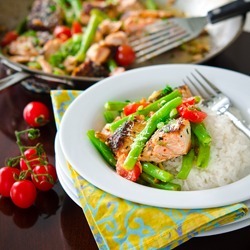 Hi Ann This salmon recipe is my family favorite. It is so fresh and yet so flavorful! Hope you get to try it. My sister and I made this for guests. It was so good. We added a bit of sweet chili sauce to the tomatoes and green beans which enhanced the flavors so much. Have already made this twice within a month. This is one of our new favorites. Thank you so much and you have a beautiful blog! 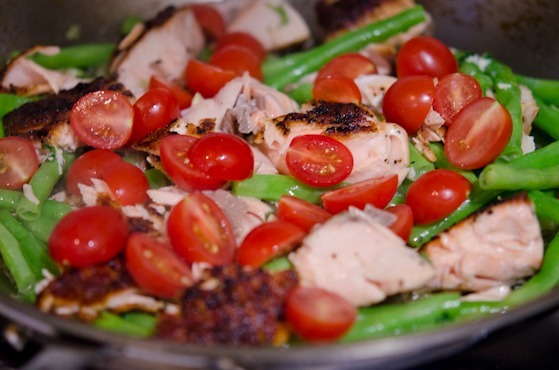 We posted it on our blog too: https://sprinkleofvanillasugar.wordpress.com/2016/03/11/oil-free-gluten-free-dairy-free-salmon-with-green-beans-tomatoes/ Hope it does this dish some justice. We made it without oil but still to die for! I am so happy to know that you liked this salmon recipe. It is one of our family favorites.